In Los Angeles, researcher Kurt Wahlner is looking for information on the installation dates for the 3 Norelco DP70s the theatre had for many years. He is researching a page on projectors and sound systems for his Grauman's Chinese fan site. 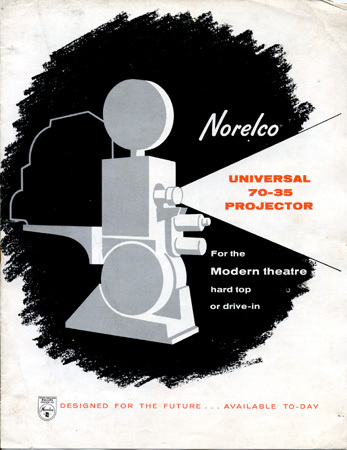 A friend and him are trying to piece together the history of all the projection and sound systems for the Chinese over the years, and there have been a good number. They are under the impression that few theatres like the Chinese has had so many projection swaps. If you stand in one spot at the Chinese, just about the entire motion picture history goes by. • 1930: 3 Super Simplex installed for "HELL'S ANGELS"
• 1930: (probably 2) Grandeur 70's for "The Big Trail"
• 1937-38 3 Simplex E-7's installed sometime? • 1953: 3 Simplex XL's with Mag Penthouses installed for "THE ROBE"
• 1958: 3 Centuries installed for "Windjammer" - possibly one Simplex XL left upstairs to show "Prologue"
• 1959: Norelco's installed for "AUNTIE MAME". 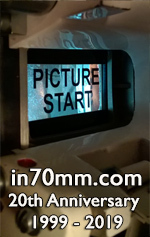 • 2003: 1 DP70 and Christie Cp2000 2K DLP installed in time for "THE LAST SAMURAI"
The theatre has had an amazing number of projection systems over the years, and Kurt is trying to obtain pictures and information on all of them. The Cinemiracle film "WINDJAMMER" played there of course, so three Cinemiracle Century projectors were in the booth at that time. But once "WINDJAMMER" closed at the end of 1958, it wasn't until mid-1961 that the Chinese hosted its first 70mm presentation of the Grandeur 70 re-issue of "THE KING AND I". So when were the DP70s installed?